Jabez moved from Yorkshire to Guernsey in about 1890 taking with him his son Thomas. A very worthy and versatile islander passed away at noon yesterday in the person of Mr. Jabez Sackett, who died at the advanced age of 84 after a very full and varied life's work, all completed worthily in every phase. Mr. Sackett was the son of the late Mr. Benjamin Sackett of Hythe, Kent, and became, like his father, a very acceptable local preacher. Of a studious disposition, his school studies were so well performed that he was sent to Westminster Training College, where he qualified for the scholastic profession. He was headmaster at various schools on the mainland, his last school being in Yorkshire. A proficient Greek scholar, he was able to give a masterly exposition both in class and in pulpit, and it is a remarkable fact that until two years ago he was a regular local preacher, having been appreciated in that capacity in the English Wesleyan Church for upwards of 60 years. Also he was an accomplished musician. Mr. Sackett came to Guernsey some 35 years ago at a time when he was in failing health. His first work was that of superintending a mission at Elim Chapel, and when that was discontinued he was employed by Mr. P.J. Ogier, now of Duval Lodge. Mr. Sackett has remained in the employ of the Ogier (Duvaux Farm) family for over 30 years, acting in various capacities, for, while he was a clerk, he certainly was of that virile type which do whatsoever their hands find to do helpfully about them. He was still at his work in November, when it became physically impossible for him to carry on any more with a work in which he always gave his utmost zeal and conscientious interest. His calligraphy throughout was like copper-plate. Mr. Sackett was a widower for upwards of nine years. He leaves five sons and four daughters, nine grandsons, 12 grand-daughters, two grandsons-in-law, and four great grandchildren: his immediate descendants being 48. The sons are Messrs. Alfred J., Frederick (Hull), Thomas E. (Manchester), George Y. (Hull), and William S. Sackett, and the daughters are Mrs. A.E.Frankish, of Hull, and Mesdames J.F.Marr, T.A.Gosselin, and T.J.Keyho, of Guernsey. The deceased gentleman was an uncle of the late Rev. Walter Sackett, and a brother of the late Rev. Benjamin Sackett, a Congregational Minister of London. 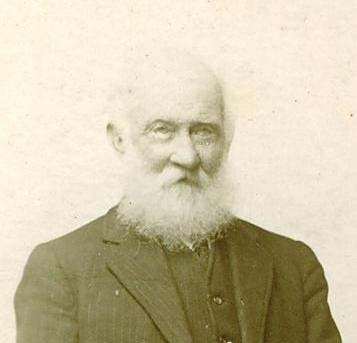 Another brother was Mr. Jeremiah Sackett, who worked in the early days of the Manchester Mission with the Rev. S.F.Collier. The funeral is arranged to take place on Wednesday, to meet at St. Sampson's Wesleyan Chapel at 3 o'clock. Chris Sackett, Ralph Sackett, Michael James Sackett, Mary Volberding, Charlotte Wruck, Rebecca Paul, Louise Jones and Susan Case. GRO Indexes to Births, 1837 to date, "Sep qtr 1840. Sackett, Jabez. Mother: Cooper. Elham. 05:156." Register of Deaths, Guernsey (Guernsey Greffe, Royal Court House), 36/514, "8 February 1925 12.30 p.m. Jabez Sackett, aged 84, s. Benjamin Sackett [mother's name not given], d. at Magnolia House, Les Amballes, St Peter Port. Occupation: schoolmaster." GRO Indexes to Marriages, 1837 to date (National Archives), "Sep qtr 1864. Sackett, Jabez. Elham." Marriages Register, Hythe, Kent (Bishop's Transcript), "5 July 1864 Jabez Sackett & Sarah Ann Young." Baptism, Hythe, Kent (England Births and Christenings, LDS FamilySearch), film 1786587, "12 Mar 1843, Sarah Ann Young, d. James Young & Sarah." Register of Deaths, Guernsey (Guernsey Greffe, Royal Court House), "15 July 1915 Sarah Anne Young, wife of Jabez Sackett, 72, father James Young, mother Sarah Smith, d. at Fairfield, Doyle Road, usual abode Doyle Road, b. Hythe, Kent." (f159/166). Jabez Sackett, lodger, unm., 20, certificated schoolmaster, b. Hythe, Kent. Thomas Sackett, son, 18 [sic: 13], grocer's assistant, b. Yorkshire, England. Laura SACKETT, dau, S, 18, b. England. Saran Ann Sackett, wife, 68, m. 46y, 10 ch., 9 living, b. Hythe, Kent, father b. Denton, Kent.